How to Increase Your Drone’s Range Potential. 5 Simple Tips. A drone’s maximum range potential always varies because of a multitude of reasons. I’ll explain how to make sure you get the best range out of yours. When I bought my Mavic Pro, prior to doing so, I had read it can reach a flight distance of up to 7-8 kilometers. Being extremely excited about this, on my second time using it, I decided to test this out. It flew no further than 2 kilometers and I wondered why this was. My question led me to discover why exactly many models don’t fly as far as they advertise flying and the truth is that if you do the things I’m going to show you, you will increase your drone’s range potential and likely hit the same distance as the advertisements claim. The advertised distance potential you see on some of the top models for example are the maximum distances that CAN be reached, but under the PERFECT circumstances that I will talk about shortly. Most of the time when you fly, there is a lot of “interference” going on that you may not be aware of, but you drone is and it absolutely impacts it’s distance potential on an invisible level that you can only see when the feed you see on your phone or remote starts to act up, but you haven’t gone as far as you wanted to with your model. -Trees are in between your controller/phone and the drone. -There are power lines in the way, routers, modems, phones, and they all contribute to the interference and weaken the signal. -Rocks are also a huge thing. Typically your model’s connection has a harder time reaching through rocks and solid areas like buildings than trees. -Perhaps there is no interference and you are in an area where that is no satellite connection. More satellite connections = a better connection and obviously a better, further flight. -Perhaps your antennas are not set properly. Some people point the tip of the antennas towards the drone, but that’s not how you get a better connection, in many cases, your antennas have to be pointing towards the sky, while it is the long part of the antennas that actually transmits the signal. – Are you using a 2.4 GHz or a 5.8 GHz connection? A 2.4 will reach further out, while a 5.8 will be shorter, but more dependable in short areas and places where there’s more interference. Do note that most drone models will not have both these options. Good tier models like the Phantom 4 Pro or the Mavic Pro 2 will though. – Are you using a phone or remote controller to pilot the drone? A phone will typically provide a shorter range due to it being entirely dependent on the WiFi signal (and other connections/apps interfering) vs a remote which will have a stronger, more centralized signal with the model. So when you take those common circumstances and go out to fly, you can quickly see just how one or more of them can inhibit your distance tests and in my case, they really did. So do not be surprised if what you see as the advertised range on the model you want to fly is different than when you test it. What connection does your drone use? Some of them are very flaky while others are very strong. Usually, you’ll have these 3 different connections on the better end models. 1) Fly higher for a better transmission between the remote and UAV. A higher elevated flight typically makes it easier to avoid lower elevation interference from the common things I listed above, including cell phone signals, and that allows for your phone/remote to have a stronger connection with the drone, thus allowing it to fly further. Of course, keep it at under 400 feet or however high you’re allowed to in your country/region. 2) Ensure there’s as little if not 0 obstacles between you and your UAV. 3) Fly in an open area and in sunny conditions if possible. Open areas typically have the least likely chances of interference getting in the way of the connection and most of the time when you see range tests on places like YouTube, it’s in open fields. The furthest flights I’ve seen, including ones that HAVE indeed reached the same limits as the advertised ones you see on big drones like the Phantom for example have been done in open fields. Also try to make sure the open field you’re in has as many satellite connections as possible, this will only help you get it out further. Satellites can also be harder for your model to connect with if the weather is bad, cloudy or potentially windy. 4) Ensure that there is a 2.4 GHz connection. I briefly mentioned GHz above, but a 2.4 is your ideal connection to use when flying longer distances. Some models have the option of switching from 2.4 to 5.8. Keep it at 2.4 if you wish to fly further. Keep it at 5.8 if you’re flying in a place with a lot of signal interference (but it’ll fly less further then). And again, use a remote controller if your model comes with it, not a phone. For example, if you take the DJI Spark model, with the phone you can’t go beyond 50-100 meters, whereas with the remote, you can get over a mile in ideal circumstances. Every major model drone on the market today has accessories like range extenders (modems and routers have these too), made specifically for the model you own. If you use them, they MAY give you a better connection, BUT honestly, it will play a better role if it’s in an open field. What range extenders do is they take your remote which normally transmits at a 360 signal and cut it in half to 180, but that 180 signal is twice as strong as the 360 was and when you point the 180 signal towards the drone, it’ll be able to maintain a stronger connection longer and further. In other words, a regular connection without the extenders is less focused and with extenders included, the connection is MORE focused but in one area. Here’s an example of these extenders on something like the DJI Phantom. They are also pretty cheap ($20). If you apply any of the tips above, you will undoubtedly get a better range from your UAV, but you also keep in mind that your battery life and the weather conditions you fly in also play a big roll (windy conditions for example drain the battery faster). Keep the following things in mind to make sure your model doesn’t go too far out that it risks crashing or not returning fully back if something goes wrong. If you do one of these range tests and plan on flying ALL the way to the drone’s maximum distance, make sure you have someone waiting at the other end of your model’s projected path so it doesn’t get stolen or land on a stranger’s property. 1) Mavic Pro. The furthest I’ve flown with it so far has been 2 km, but that was with trees in the way and other obstacles. Never the less, that was VERY impressive. 2) Phantom 4 models, all the way up to the Phantom 4 Pro. I use the Pro and I’ve flown about 3+ km out with it. 3) Inspire 1 & 2. I don’t own either of these yet, but am saving up for the Inspire 2 in the future (unless a better one gets released). Update: Mavic Pro 2 currently beats the other models. 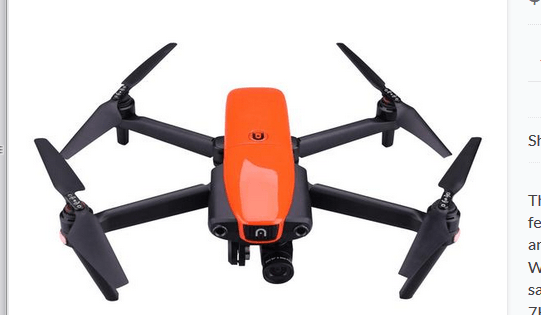 It has the best known connection in drones, known as ocusync (2.0) and gets a max range of 8 kilometers. 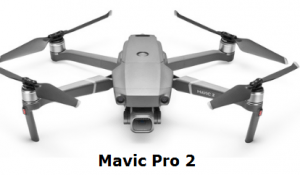 Second to that is the original Mavic Pro and Phantom 4 Pro V2.0, both of which use the original ocusync 1.0 connection. 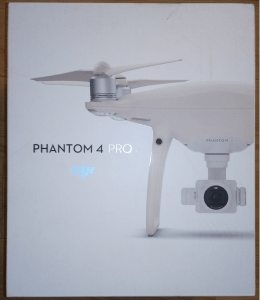 I have the DJI Phantom 3. I live in Toronto, Canada so lots of high rises, trees, but I get it so far I have to be careful I don’t get disorientated and should have gone right instead of left and the controller only has 5.8Ghz which I have no problem with. I go to my Grandmother who lives in Waupoos, Ont. There’s a point there called the Rock and has a 2.8-degree magnetic deviation, I can’t get 1000 feet of I can get a 100. I have flown on 2 occasions there and the same result both times. I have been in Radio Controlled hobby for a good 25 years now and this bewilders me and I can’t find anyone who knows, who has experienced this. I even contacted DJI directly and they had no answer. Have you any input to this? I have also experienced this issue with being in a high elevation and the drone not flying higher because it already set the low point further below my actual take off. If changing the altitude settings isn’t helping, then I think the issue is a firmware update that makes this impossible. Lately I’ve known the DJI firmware updates to be quite strict in how they allow you to pilot your drone and even though settings are allowed to be changed, ultimately, they can regulate how high and far your drone goes, including “no fly” zones where even if you try to fly into it, it won’t let you. On that, I agree with them, but on the issue of altitude limits, I’m also lost. My only guess is perhaps it may work IF you reinstall a previous firmware to your P3 and see if that works. If not, look at Phantom forums around Google, they tend to have a lot of diverse and experienced fliers. For the elevation issue, power upon the ground and recalibrate the gyro, it will take into effect the elevation, at least it does on the Phantom 3 and most quadcopters on the market will do the same, especially in FPV mode. As for the magnetic deviation, like I said, even DJI didn’t have an answer, I have checked forums but I have yet to find anyone who has flown in a magnetic deviation. The only thing that should happen is that it should be off course (depending on distance traveled) when compared to a GPS that is not in the affected area. I actually found out about the deviation by overhearing these Coast Guard guys in a coffee shop talking about it, that’s why I went the second time to confirm that it was affecting the flight and it wasn’t some glitch or interference. I do find the DJI Controllers have a real slow latency so I have plans since all my warranty is up to installing a good Tx/Rx with a line of sight 2.4GHz. If you do come across someone who has flown in a magnetic deviation, ask them what the effect was, with any drone really as long as it’s GPS. Please post the findings as well.I have flown quads there and they are unaffected. Thanks for your help. 1) When the drone has no GPS signal and goes into Attitude mode? 2) Is it when you get an error signal on your remote that says “magnetic interference”? I suppose in either case you probably already know what to do, but just in case someone who isn’t familiar with these things, let me just say that attitude mode is not a mode I’d fly under, since there’s a HUGE risk of crashes happening and if you DO get the magnetic interference signal, you’re likely in an area where there’s high overlapping magnetic waves (perhaps you’re extremely close to a cell phone tower or something) or you’re standing on or near an area where there’s metal and that is affecting the compass/GPS. I’ve got a DJI Phantom 4 and I’m always very careful with where I fly and how I do it, since I’m aware that drones can be dangerous if we do not keep in mind a few basic security features. I didn’t know about the signal extenders. those can be really good to not lose contact with the drone! I’ll get some for sure. Thanks for bringing awareness about drones in this sense, we need people to stop thinking they’re toys. Hi Israel, I don’t think you’ll need a signal extender, a P4 drone is actually quite advanced on it’s own and has a crazy good range as it is. If anything happens, just make sure you record your home point before the flight starts so it can come back to you safely. It is great that you’re utilizing safety techniques to ensure nothing happens, but like I said, a P4 is such a high end drone that you really need not worry all that much about it, just exercise the basic rules in your area and you’ll be fine. Unless there’s a lot of areas where you fly that may cause a signal loss to happen, just exercise the ideas I talked about to avoid those issues. Hi Anthony, I honestly don’t worry too much about losing my drone, so long as my home point is set and it’s an open field which the drone can easily fly back to. Otherwise, I make sure NOT to fly far and always keep it in my sight so I can manually navigate it back in case something happens. Concerning the parabolic reflectors, try using them in an open field, I think you’ll be able to truly experience their potential there. I have found areas with a lot of mountains, trees and generally lots of obstacles don’t really mix well with those reflectors so you may not get the best use out of them there. Beaches, farms, ect… are perfect though. And finally, the height rule is actually dependent on the area you’re in and what you want to film. I don’t know if when you say Pacific northwest, if you mean the US or Canada, but in the U.S, FAA guidelines permit you go beyond 400 feet, if your area you’re flying in is already above sea level OR you wish to film a particular object that is above 400 feet. I use mine in open fields to look at acreage and make sure there are no livestock in distress. Where it is open I have no issues on distance. There are just a few sparse trees around. I did buy the Mavic Pro. I did not know there were range extenders. I would like to purchase this because I would be able to reach another farm I own with it. Are these range extenders expensive? The one for the Mavic Pro is about $20-$30. How far is this other farm of yours? In an open field, you can very well get the 7-8KM range with the Mavic Mike, I’d test it out first before getting the range extenders. 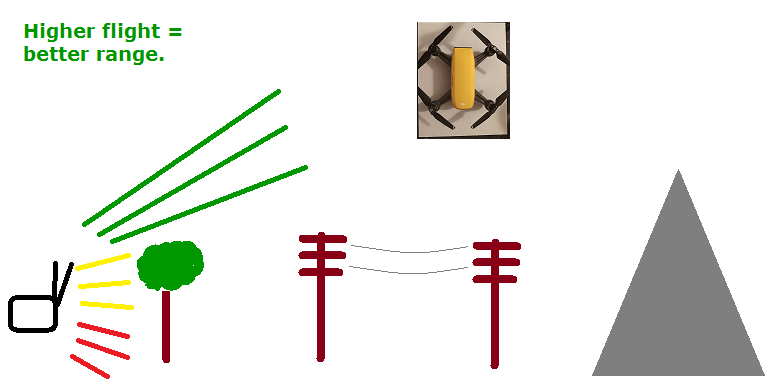 I love the illustrations in your post, that really gives me a great idea of all the obstacles that can interfere with a drone signal. I assumed that because I live in the desert, that there really wouldn’t be many obstacles, thinking mainly trees. But if I take the drone with me on a hike, I will have to be aware of rocks or boulders. That’s interesting about the advertised distance of the drone. I equate that to MPG on a vehicle you might consider buying. The MPG they advertise is the maximum you can possibly get under perfect conditions. I was a little confused by the point of power lines interfering with the signal. Are you saying that modems, phones, in the area can all have an effect on the signal? I really didn’t know that might be an issue. As always, you have a ton of great information, thank you. Power lines, phones and other things that have their own signal can very easily interfere with the signal transmitted between your drone and your remote Steve, so that can absolutely play a negative role on the connection/range. As for mountainous areas and deserts, for mountains, if your drone is behind a mountain or tree, yes it can interfere with the signal, but if you’re on top of a mountain and sending it out into an open area where there’s nothing blocking your and the drone, then it will get a good signal. The same applies to deserts, but another key point is the number of satellites your drone picks up before it takes off. Some higher end models list the number of satellites they are connected to pre flight and the more of them you have listed, the better connection it’ll have (in addition to the rules I said). Drones are pretty amazing and so many people are getting into this type of hobby. Drone flying has become so popular that it is just mind blowing. I have a son that is in to this big time, in fact he wants to upgrade. Thanks for these helpful tips as I will be passing them on to him. Nice Norman, what type of drone does your son currently operate? I am the Fire Chief in my hometown and we use a drone for emergency use often. We have purchased a FLIR or a thermal imagine camera (TIC) that we use to find people ejected from cars during a motor vehicle accident or run away children or intoxicated adults on the run through the rural area we live in. We have two units stored in the back of a covered truck that we keep plugged into electricity to charge the batteries. I learned from your site that if cell phones are used then that may limit our range. I did not know that.We currently do not have any kind of device that will extend our range. Have you used these yourself and seen a great improvement? Hi Bobby, I’d have to know what type of drone your station uses. Cell phones and basically anything that emits a signal can cross with the one between you and the drone, but usually this isn’t a problem unless you’re really looking to fly very far, we’re talking kilometers. Otherwise, if it’s a low quality drone, it won’t be able to fly far away from you as it is, so it won’t matter which signal is in the area crossing with it, and if it’s a high quality drone, you can probably get at least 1-2 kilometers in range before the other signals start to affect the connection. A range extender does not affect the battery life on the drone, it’s how fast you fly you and under which conditions mild/harsh that does. 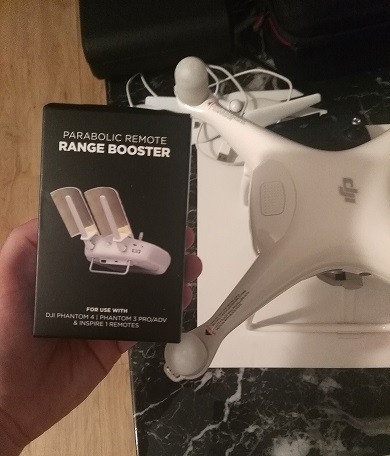 I do have one for my Phantom 4 Pro and my results haven’t been conclusive, since I haven’t used them in an open field and that’s where they are said to work best. Great article, I don’t have my own drone but it is on my wish list for sure. I have the opportunity to watch my son, who has his own drone, it’s fantastic how he makes it fly with no problem. He loves it and every chance he has he takes it to fly it again, as he lives in a big city, he always looks for a place out in the country to drive to and fly his done for a while, I’m sure he will love to read your article and your website to learn more about drones. It’s an addictive hobby for sure Alejandra and your son is doing it right by looking for an open space (not the city) to fly his drone. Really interesting article, i hadn’t considered that so many things contribute to weakening a drone’s signal. I bought a medium end one for my son and it was supposed to have 5 km range but we were lucky if we would hit 1/4 of that. Now I know why, and I didn’t realize there were range extenders for the remote. That’s kind of a neat idea, and they’re fairly cheap at that! To be honest, that would make for a great Christmas present! I’m glad I stumbled on your site, look forward to checking out the rest of your pages. What kind of drone did you get your son? A 5 km range is no joke and that tells me it has to be a higher end model, just curious. I have never thought of the parabolic reflectors. I think this could help, seeing there are free plans to make your own with tin foil and card stock. This could help a lot. I also never thought of the elevation problem. This could be an issue too. Although when I go to the mountains and fly it seems to be more open and I get better range. Do you think thinner air makes lift better or worse? Are drones tested at sea level or does this matter? Hi Malachi, I think you misunderstood what I meant in regards to elevation. It doesn’t actually hurt the connection, in fact, it can be better for the connection. Problems would occur IF the area you’re in has no phone towers or cell phone reception. This would mean you’re basically in a bad zone, which would also affect the drone’s connection. As for how drones are tested, if we’re talking about maximum distance tests, I would assume they are tested either at sea level or at higher elevations, BUT only when there are no obstacles for miles (it’s a wide open area basically) and there’s a strong connection no matter how far the drone flies. Hi. I have worked in instrumentation for some years. Somehow the figures supplied do not add up? The phantom 4 drone according to the manufacturer can fly at 42 mph. This gives it a one way range of 21.5 based on the assumption at 30 minute flying time would give it at 42 mph zone. The figures do not add up. So I am to assume the transmitter does not have the capacity to transmit over the drones max flight distance so this is a myth. Somebody is not telling the truth? The max speed and range are based on IDEAL circumstances Peter, such as a clear day, little to no wind and an open range to fly it. In fact, there was a guy on YouTube (NevermindYourown is his channel) where he flew a regular P4 almost 8KM one way before it ran out of battery. You can’t divide the speed based on halfway ranges, if the drone is going to go 8 KM, it’s more than likely going to be one way, since it won’t have enough battery life to come back. I’ve personally tested the speed of this thing and while I can’t grade the exact mph, it did seem above the 40 MPH mark.